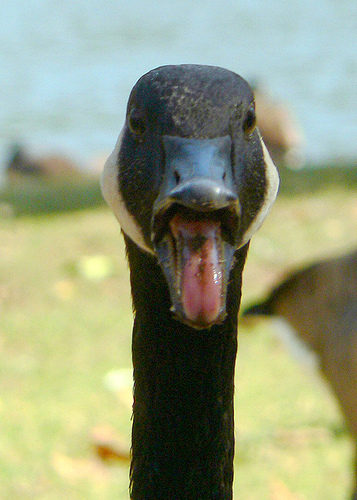 John Needham told the Lancashire Telegraph that the Canada geese flew at him while he was riding along the Leeds-Liverpool canal, with two of them pecking at him as he lay on the ground. "I was on my mountain bike when one of the geese flew straight at me," explained the 49-year-old. "I managed to toss it to the side, then another two came at me and knocked me off my bike. "The handlebar went right through my hip and that is when they pounced on me. "They pecked at my finger, my elbow and my knees. "My injuries are painful. My hip is sore. It is badly bruised and there is a big bump there."